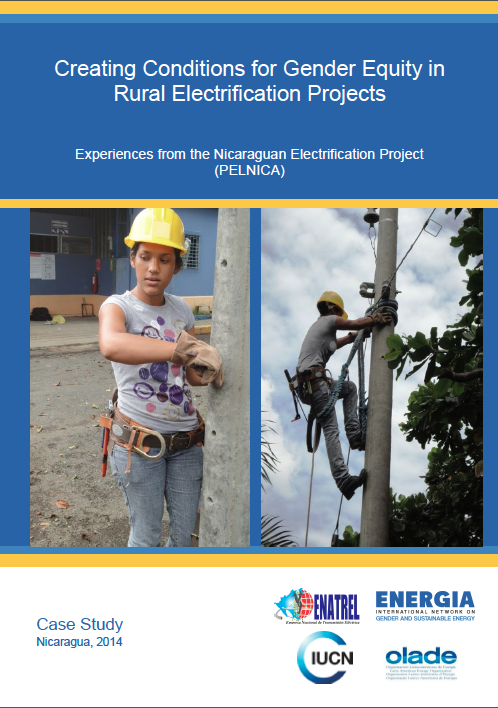 The Nicaraguan Electrification Project (PELNICA) is implemented by the National Electric Transmission Company (ENATREL), with financial and technical support from the Ministry of Foreign Affairs, Trade, and Development from Canada. PELNICA is implemented in seven departments of Nicaragua (Nueva Segovia, Madriz, Estelí, Jinotega, Matagalpa, León, and Chinandega), and it was designed with the objective of contributing to economic development to improve quality of life for women and men. For this reason, project implementation has used a series of different gender methodologies and tools. PELNICA has focused its activities on promoting greater women’s participation in decision-making spaces, as well as supporting women’s economic empowerment as a needed element for rural sustainable development. This study highlights the results for gender equality obtained through PELNICA, and shares some reflections on how this six-year process has been able to influence the design and implementation of other similar projects in Nicaragua, as well as expand its impacts by building strategic alliances with local governments. Por favor presione aquí para la versión en español.